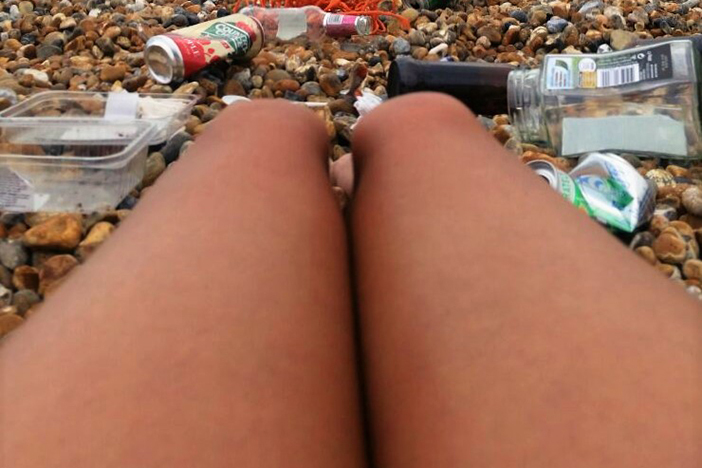 Don’t be alarmed if you spot a team of naked litter-pickers on the beach this weekend. This is Brighton after all. On Sunday, local environmentalists are gathering at Black Rock to clean up some of the rubbish that clogs up our shores in increasing quantities. And they’ll be doing it naked. We spoke to Russell Arnott, one of the organisers, to find out why. Why are you cleaning the beach in the nod? Black Rock nudist beach is one of the less frequented beaches in Brighton. But it’s down-current of the longshore drift and next to the marina breakwater, so a lot of beach detritus tends to accumulate. We thought it would be nice to do a naked beach clean as we’ll be cleaning a naked beach AND beach-cleaning naked! Yes, but why get naked just to pick up rubbish? It is also a fun way to engage people about the problem of marine litter and plastic pollution. At present, eight million tons of plastic is added to our oceans every year and because it takes hundreds of years to break down, it just keeps accumulating and washing up on our beaches. Marine life and seabirds get tangled in it or eat it and it can also work its way up the food chain into us. While organisations like the Marine Conservation Society and Surfers Against Sewage run beach cleans throughout the year, we thought we could raise the profile of marine litter by taking our clothes off. Do you take your clothes off to clean your house? Fair enough. Is there a connection between this and the naked bike ride? This event is being organised by the World Cetacean Alliance and the Brighton Naked Bike Ride. The connection is that I’ve done the naked bike ride numerous times, but last year I was inadvertently photographed by Brighton photographer Danny Fitzpatrick as he was taking a photo of Nick Sayers (organiser of the bike ride). The photo (that involved my buttocks) was then put on display on Brighton Station concourse as part of a Fringe event called ‘Faces of Brighton’. My buttocks caused a woman to complain about the indecency of the image and so Southern Rail removed it thus causing some media hoo-ha. The portrait of Nick and my buttocks is now on display in Marwoods Cafe. Apart from that, we felt that there are a lot of parallels between the naked bike ride and the naked beach clean: both aim to highlight environmental issues, both promote a healthy lifestyle and, of course, both involve not wearing any clothes. How does Brighton beach rate in terms of pollution? I love Brighton beach and go swimming in the sea as often as I can. I also enjoy snorkelling round the West Pier and picking mussels for moules mariniere. The biggest problem along Brighton beach are the beach users themselves – having a beer and a BBQ on the beach is one of life’s little pleasures so I find it unbelievable that people would visit the beach and then leave their bottles, cans, plastic bags, pizza boxes etc all over it. Another part of the issue are businesses along the seafront that are happy to sell people food and drink in non-recyclable, non-biodegradable packaging which is then left all over the beach. If a business is profiting from the beach, surely it’s in their best interest to help maintain a healthy beach? What are the most common items you’re likely to find? Straws, straws and more straws. I hate straws. They are everywhere. Hats off to the Tempest Bar – they’ve banned plastic straws and provide customers with reusable metal ones instead. We intend to break the Guinness World Record of naked people for the event, but we’re not sure how many to expect. It’s the first time anything like this has been done and like all things in the UK, the turnout is largely weather dependent. We’d be content with 40 to 50 people but obviously the more the merrier! How long do they need to be naked for to count towards the record? I believe that there would need to be a critical number of naked people cleaning the beach simultaneously for the record to count. I’d like them to remain naked until the beach is devoid of man-made debris and marine litter so we can look along Black Rock beach with satisfaction and a warm fuzzy feeling in our tummies. What does the record currently stand at? There isn’t a record at the moment! So even if it is just me and Nick all by ourselves, it’ll still be the largest naked beach clean ever!